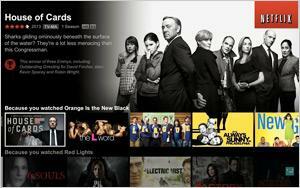 Despite a string of successes in 2013, analysts are already questioning whether Netflix can hold its own in 2014. Citing more competition in the digital video sector, a new report from Morgan Stanley doubts whether the content company can sustain domestic subscription estimates going forward. No one is suggesting that Netflix isn’t coming off a great year. In fact, recent estimates from Needham & Co. suggested that the company surpassed HBO in the all-important category of paid U.S. subscribers. Boasting 31 million domestic subscribers, Netflix’s third-quarter earnings report sent investors into a tizzy, in late October. Having witnessed such euphoria before, however, CEO Reed Hastings said such wild reactions by Wall Street are best to ignore. At the end of an investment letter, the seasoned CEO stated: “We do our best to ignore the volatility in our stock." Hastings, it appears, was wise to urge restraint. Morgan Stanley on Tuesday downgraded Netflix shares to underweight from equal-weight and lowered its target price from $333 per share to $310 per share. One issue: to meet Morgan Stanley’s 2014 domestic subscription forecast of 39 million, it estimates that over 48 million out of 92 million residential broadband households would need to watch Netflix over the next 12 months. Devitt and his team still view Netflix as the most broadly appealing streaming video service in the U.S. market, but predict that rivals services are offering increasingly compelling alternatives. Making matters worse for Netflix and other paid-services, many of the major broadcast and cable networks are streaming TV episodes on their Web sites for free for some period of time after the episodes air. CBS, for one, recently reported that online streaming was up 40%. As for whether streaming video become saturated in 2014, Morgan Stanley assured that the number of American consumers able to stream high-quality video continues to rapidly increase.